For the first time, I’m thrilled to be joining with my fellow bloggers in the Village Green Network for a giveaway through Friday December 20 – right in time for the holidays! 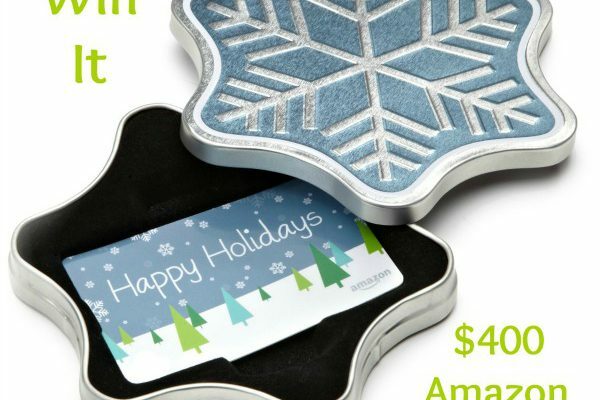 We are giving away a $400 Amazon Gift Card and the winner will be announced on Saturday, December 21. Below are directions for how you enter. You can enter the drawing here and on all the blogs listed below. 1. Click here to check out the gift card on Amazon to see what you could win! (Come back after reading to finish steps 2 & 3). 4. Leave a comment letting us know how you will be spending your gift card! 5. Use the Rafflecopter widget at the bottom of this post to confirm these entries and unlock more! ****A winner will be chosen via Rafflecopter.com. We will announce the lucky winner on Saturday, December 21, 2013 (so be sure you follow me on Facebook!). Once contacted, the lucky winner will have 48 hours to respond with his/her full name, address, and phone number. There is no purchase necessary to win. This giveaway is open to everyone except where prohibited by law! I would love some more essential oils and a kindle! I would love an Amazon gift card to buy presents for others, so many friends are having a hard time financially now. Looking to start our first flock of chickens and Amazon has just about everything we’re going to need. There are so many things I would like to buy since we just moved back from living overseas and need so many household things. However, I would probably buy some thermal blackout curtains and some Christmas presents! I am thinking Vitamix – but Amazon has so much to offer! Healthy foods, books, essential oils! I would by some new pots and pans. Mine are so hammered. Thank you for this opportunity! I would love to get some of my wish list books that I don’t get as gifts. I would probably subscribe to a year of Amazon Prime. Then get a bunch of books and apps for myself and my son. Possibly some clothes for him, he’s growing so fast.